Nearly a quarter of the Sri Lankan population lives below the poverty line. This economic situation is the invariable result of decades of armed conflict. The war has taken a heavy toll on the finances of families who have found themselves without shelter or food etc. The situation is improving little by little, but life remains difficult for certain households. Children are the most vulnerable and have seen many of their rights impeded by poor economic circumstances. Health services have undergone some improvement, yet remain far from ideal in Sri Lanka. They are notably rare in rural regions. Consequently, children’s access to care in such areas is limited. The long civil war has put a considerable strain on health standards. One sees this at a material level, at a hygienic level and at a human level. Among the problems that remain worrisome for Sri Lanka is the fact that 17% of newborn children suffer from dietary deficiencies. Children have not been spared from the bloody conflict that has engulfed Sri Lanka over the past decades. The war has affected their situation in more ways than one. Thousands of people have died or disappeared during these years, often leaving their children to carry on by themselves. Life for these orphans has proven difficult. Some of the more fortunate have been united with their families, but most of them remain abandoned, homeless and without access to any form of aid. Children also figure among those people who have disappeared. The search for them still goes on, but no one really knows what has become of them. Other children have suffered considerable displacement from their place of birth. Progress has been made to establish who is responsible for them and to help them return home; however, not all of these childrenhave been able to benefit from such aid. Sri Lankan history took a tragic turn in the 1970s on account of discrimination and racism. Today, there has been some improvement in the situation; unfortunately, a certain amount of bigotry persists. Granted, it is more nuanced and hidden from view than in the past, but it remains very real. Children are the primary victims of discriminatory practices. Those children who belong to Vedda, Muslim or Tamil communities find that their rights are not respected by everyone. A certain segment of the population views them with hostility and construes their religious identity as a refusal to become a part of Sri Lankan society. Consequently, a number of principles enunciated by the International Convention of Children’s Rights have ended up being scorned. 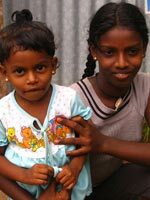 During the conflict between the Sinhalese national army and rebel groups, it was a common practice for both sides to forcibly recruit children. Nor was it uncommon to find brothers obliged to fight each other on account of their having been recruited by opposing sides. Since 2009, the conflict is officially over. Nevertheless, the problem of child soldiers persists. Despite the fact that they are no longer combatants, they still suffer from the repercussions of past events. As a result of all the violence, torture, and cruelty they witnessed or were forced to take part in, they suffer from a variety of problems. Some of these are health-related, while others are related to the issue of moral development. In any event, their social rehabilitation and reintegration remain extremely difficult. In Sri Lanka, 30 years of war have also had an extremely negative impact on children’s education. On the one hand, the services themselves have suffered considerably (vandalism, looting and wholesale destruction of buildings, closing of schools, etc. ); on the other hand, the children have fallen considerably behind in their schooling. Certain efforts have been made to improve the situation. However, the education sector has a long way to go before children’s right to an education will be fully guaranteed for all young Sri Lankans. 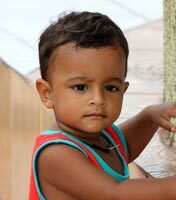 It is estimated that in Sri Lanka, one out of every eight children is economically active. Often, it is poverty that prompts families to make their children work. As for the sectors that make use of child labour, these include tea plantations and household help for rich families. Other children end up being exploited by traffickers who subject them to even worse forms of employment. Sexual exploitation is a serious cause for concern. The leaders of various criminal enterprises have on too many occasions persuaded minors to engage in prostitution. The number of child marriages has been on the decline in recent years. However, it remains a problem. It is estimated that 12% of young girls marry before the age of 18. Marriage at a young age often has a harmful effect on the children involved. They do not understand what such marriages entail and often end up suffering as a result. Young girls do not always get to choose their future husbands. In rural regions, for example, marriages are heavily influenced by caste and the size of one’s dowry. The man’s age is also important; usually, he must be at least 5 or 6 years older than the bride.